Patient had a kidney transplant years back. This causes him the need to take continues medication. Thus, his heart is affected. He also felt shortness of breathing. 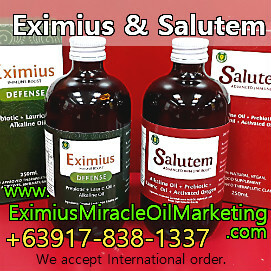 Just after 3 days, consumed 2 bottles of Eximius Miracle Oil, the patient has improved a lot. His pulse rate greatly improved. None to poorly palpable pulses has lessen. Before, he has a bell to ring if he needs something. After the 2 bottles, he doesn't use the bell anymore. He can also go out on his own. SP: On my bro after 2 bottles. For my sister she wasn't done consuming the 2nd bottle. Still vomiting. SP: Yes stop pulse rate after 2 counts then 2 counts again. SP: Yes through finger just like what Dr Tan does. 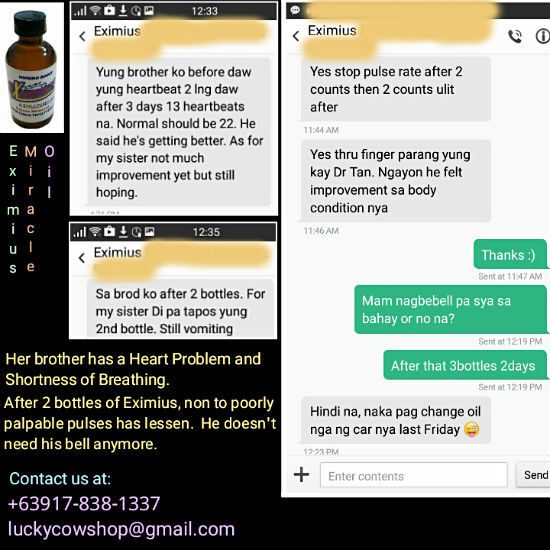 Now he felt improvement on his body condition. Me: Thanks :) Does he still use his bell at home? After that 3 bottles 2 days?